This review WILL CONTAIN SPOILERS and CAPSLOCK because I have so much to rant about.The first 100 or so pages of this book are good. Not particularly well written but the story is intriguing and there is some genuine emotion. I was moved when Rachel was re-apprehended by the Nazis because she fought so hard and became so ill, all for nothing, that it was tragic. More tragic than the situation with Michel if you ask me. 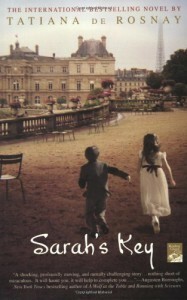 I liked Sarah's chapters.Where this book fell absolutely flat to me was Julia and her 'plight'. But a few things I'd like to mention about the people around Julia first. Bertrand. I didn't understand why Julia claimed to love her husband and find him so charming but all she seemed to feel toward him was contempt and annoyance. And rightly so because he was an arrogant jerk!Julia's daughter Zoe was ...not a child. At all. I'm so sick of the wise-beyond-her-years kids. Sarah had a reason to be mature, Zoe was just badly characterized and a tired trope.Finally there's Julia herself. I really, really didn't like her. At first I just found her boring in a "Bleh, get back to the tragedy of human suffering!" way but as the story progressed and Sarah's chapters were dropped I began to find Julia, her problems, and her goals insufferable. So, ok, you're pregnant after 2 or 3 miscarriages and your husband doesn't want the kid. Yes, that's a problem and I was mildly curious how it would turn out. But then you decide not to go through with an abortion because this baby is the most important thing in your life. So you randomly fly from Paris to the USA.Then USA to Italy.In the matter of days.And then you feel a little annoying 'tug' and think nothing of it.WOMAN YOU HAVE HAD 3 MISCARRIAGES, YOU ARE IN YOUR MID 40'S AND ARE RANDOMLY GALLIVANTING ACROSS THE GLOBE GHOSTCHASEING BUT YOU CLAIM THIS BABY IS THE MOST IMPORTANT THING YOU ARE A HORRIBLE, IRRESPONSIBLE, SELFISH PERSON AND A BAD MOTHER!Seriously? !Even all that aside, the amount of arrogant rich white woman hubris Julia has is revolting. Why should she dig up the past? What right had she? Obviously Sarah wanted to keep it behind her. Obviously she didn't want to burden her family with it, nor the Tezac's wish to remember the burden of it either.And then of course there was all this eternal monologue about how Julia "would always remember the tragic day they rounded up those Jews" and "She knew what it was like" because she wrote an article about it. That is just as bad as "I know what it's like to be in a wheelchair/blind/raped because I played one on TV".Finally, the writing. While the writing wasn't strong, I never really seemed to notice a problem with it until near the end. The word "Ironic" 4 times in 4 pages? Really? And it was "ironic" that you missed Paris after moving back to New York? No it wasn't! Remember near the beginning of the book Julia, where you said you had always loved Paris, more than in the romantic cliche way, but in all the other ways? You had always felt a tug and longing from and for Paris! You met your husband there, you had friends there, you had your daughter there, you had a good career there. Of COURSE you would miss it! There is nothing ironic about that!There was an awful lot of telling, not showing. One of the most blatant examples occurs after she almost has a miscarriage and is told to lie down and work from home. We're told that. And the time just zooms by! We don't get Julia's frustration at being bed-ridden, at her lingering pain or guilt that she almost caused the loss of a third or fourth child, or anything like that. Nope! "I remained horizontal while my 11 year old made me breakfast in bed for X amount of days. "Am I supposed to be getting some sort of parallel from all this? How humanity hasn't change much since the Holocaust? That the problems of the upper-class are just as valid as the tragedy of thousands rounded up then carted off to death camps?You know what? I was going to give this book 2 stars but no. One. One star for Sarah and Rachel and Michel. No stars for the rest of this book.Now I'm off to watch the movie adaptation.